The small people who live here LOVE marshmallow peeps. (Well, so do I. And yes, I'm aware that they are nothing but sugar and are completely bad for me.) 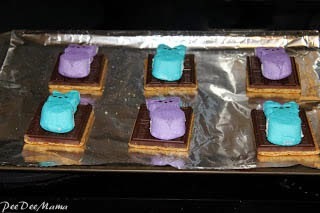 So when I came across a recipe for s'mores using peeps, I had to try it. 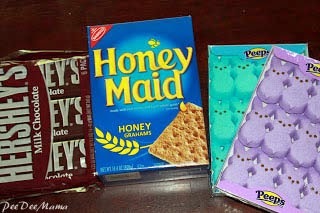 The ingredients are the same as for making s'mores; you just substitute marshmallow peeps for the marshmallows. We used the rabbit shapes. 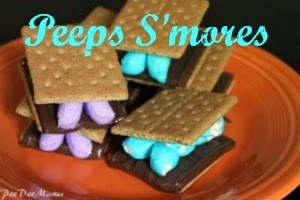 Use 1/2 of a graham cracker as a base and layer with 1/2 of a Hershey bar and 1 peep. Since peeps tend to explode in the microwave and I had no desire to clean that up, we put ours in the oven at 350 degrees for 2 minutes, watching it carefully to make sure the peep didn't scorch. I suggest lining the cookie sheet with aluminum foil for easy clean up. After taking them out of the oven, put the other 1/2 of the graham cracker on top and enjoy! Do you have a recipe to share? Link up below.